When a sub class contains new components which are not declared in the super class then calling the new components by creating a dynamic reference of super class will cause syntax error in the system. Here we have defined a parent class and a child class inheriting from parent class. In the parent class we have declared a method m_par. And in the child class we have redefined the method m_par and a new method m_chi. Now we have declared the object obj_par referenced by parent and object obj_chi referenced by child statically. At the time of object creation we have referenced obj_par of type child by dynamically. Now whenever we call the method m_chi by obj_par then syntax error will come. Here the error comes because the method m_chi is unknown to parent class though obj_par is dynamically referenced to child class. Hence the super class object obj_par has found the method m_chi a new component which is not declared in the super class. Below we have defined a modified version of the program where we have created static reference of parent and child class. Then we have called method from super class. After that we have called the same but redefined method from sub class by creating the dynamic reference of the super class. CLASS child DEFINITION INHERITING FROM parent. v_txt = 'Parent Class Method'. 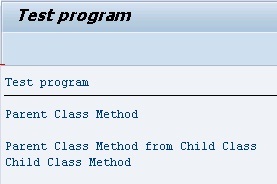 v_txt = 'Parent Class Method from Child Class'. 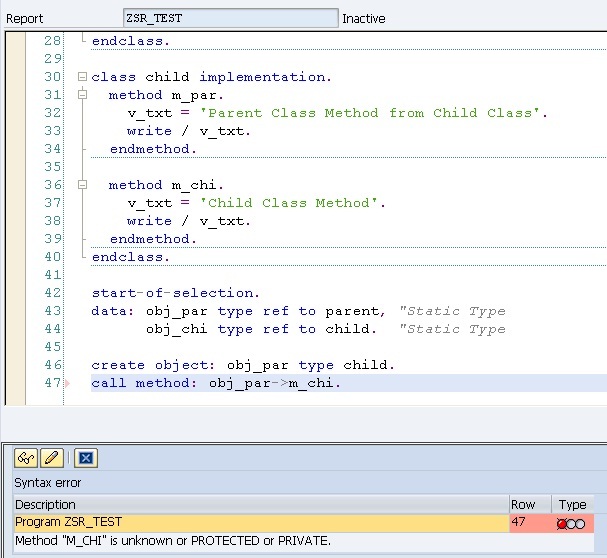 v_txt = 'Child Class Method'.